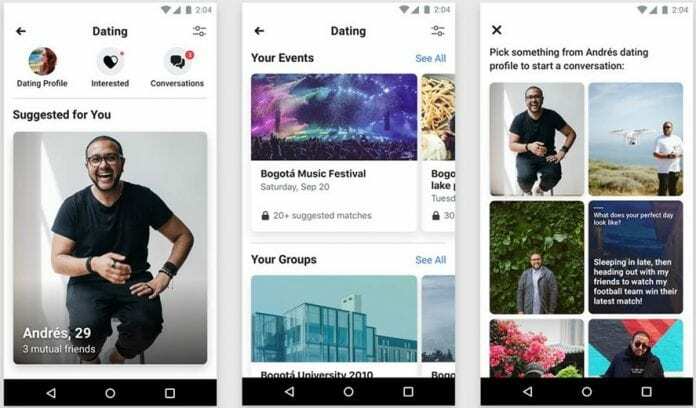 Facebook has started rolling out a countrywide test of its new online ‘Dating’ feature in Colombia that aims to take on major dating apps, such as Tinder, Bumble and Match. For those unaware, Facebook had originally announced the feature at the F8 developer conference in May this year. The online Facebook Dating feature will allow people able to create a dating profile that is separate from their Facebook profile – and potential matches will be recommended based on dating preferences, things in common, and mutual friends. The dating feature has been built keeping privacy and security in mind. How Does Facebook Dating Works? Based on an algorithm powered home screen, the all-new Facebook Dating feature of the app basically helps users to select romantic matches from Facebook’s wide pool of single users. Since, the Facebook Dating feature is optional and is supported through the app, the users will have to select it to use the service. The users will then have to fill out basic information about themselves, such as age, gender, occupation, education, religion, etc. Facebook also offers non-binary genders and sexual orientations. Users are allowed to upload up to 12 photos on their profile and can respond to as many as 20 questions, such as “What does your perfect day look like?” or “What song always makes you sing along? How loud?”. These will not only help the user’s match to know him/her better but also make it easier for them to strike a conversation with the user. Also, there is no swiping left or right to like or reject potential matches unlike competitors Tinder or Bumble. Instead, the user will need to scroll down through a person’s profile and tap if he/she is interested. Those opting for the service will have to verify their location and will be able to find matches within 100 kilometers. It will suggest matches to users that they aren’t already friends with. Additionally, the users will have the option to discover others with similar interests through their Groups or Events so that users can find even more prospective matches. However, what people do within the Facebook Dating feature will not be shown to their friends. The Facebook Dating feature is limited to text and emoji-only, which means photos, links, or other media cannot be exchanged, as Facebook is aiming to foster meaningful relationships through the app. The Facebook Dating feature is free and currently active in Columbia. Users aged 18 and above can avail the online dating service by signing up for it. However, Facebook will let users start matching their profiles with each other only when it thinks it has collected enough profiles, which could be days or weeks, the company added. For now, Facebook Dating is mobile-only, and is a part of the main app. If Facebook’s Dating feature is able to make an impact on its users, then it could pose a great threat to major dating apps, such as Tinder, Bumble and Match. What do you think of Facebook’s Dating feature? Would you give Tinder, Match, Bumble, or Hinge amiss to use this feature, do let us know in the comments section below.